Author: Eva Rothmaler. Translated by: Gisela Seidensticker-Brikay †. Series edited by: Gisela Seidensticker-Brikay †, Kyari Tijani. 12 pp. Roman, 317 pp. The present study is concerned with the analysis of the various aspects of settlement names in Northeast Nigeria. These toponyms can be regarded as linguistic and historical records of a region. 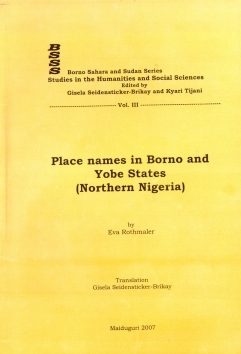 The source material for this book consists of historically substantiated settlement names gathered during a field trip in two areas of the former kingdom of Borno. Initially the strategies of word creation of the five major languages spoken in Borno (Kanuri, Hausa, Shuwa-Arabic, Malgwa and Fulfulde) found in these toponyms are scrutinised and detailed with examples. Afterwards the etymological content of these settlement names is determined in the context of the closely intertwined histories of the Kanuri and the kingdom of Borno. This allows the author to highlight the changes in the social structures of the naming ethnic group, the relationships between different ethnic groups, the deterioration of the ecology of the Lake Chad region, and the shifting perception of the environment. Precolonial and colonial records are used to further discuss the historical as well as ethno-sociological aspects of these processes. The dominating influence of the Kanuri language in the region today is marked by the fact that most contemporary settlement names contain Kanuri elements. But the antiquity of toponyms of unknown etymology and their accumulation along the rivers are indicators that Borno was densely populated even prior to the immmigration of the Kanuri in the 14th century. Therefore, the juxtapositioning of historically substantiated and modern settlement names can help to trace shifting settlement patterns and the (re-)naming of settlements as expressions of the struggle for ethnic or political dominance. 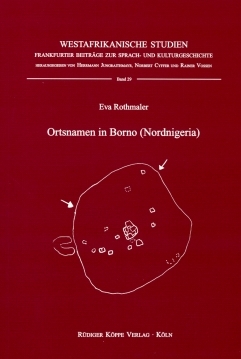 This book is a translation of the book edition Ortsnamen in Borno (Nordnigeria) by Eva Rothmaler, published by us in 2003, see the following link. This English edition is being sold in commission by our publishing house. It was printed in Nigeria in 2007 and may exhibit a bad printing quality, as well as transport and storage damages. The study by E. Rothmaler is an important contribution and a significant step in the field of the African toponymy. It is characterised by a far-reaching scientific scepticism, especially in the analysis of those place-names, etymology of which is rather unclear. Her data come from many languages, even from those not-familiar to her. It will certainly constitute a stimulus for further research in this direction.